On the 20th (Mon), steep yourself in history at Castelo de S. Jorge, then take a stroll through Alfama, then make a trip to Santa Justa Lift, and finally wander the streets of Belém Tower. On the 21st (Tue), you'll have a packed day of sightseeing: take in the spiritual surroundings of Jeronimos Monastery, then step into the grandiose world of Quinta da Regaleira, and then admire nature's wide array of creatures at Lisbon Oceanarium. To see where to stay, more things to do, maps, and tourist information, you can read our Lisbon itinerary tool . Toronto, Canada to Lisbon is an approximately 10-hour flight. The time zone changes from Eastern Standard Time to Western European Time, which is usually a 5 hour difference. When traveling from Toronto in August, plan for somewhat warmer days in Lisbon, with highs around 35°C, while nights are about the same with lows around 20°C. Cap off your sightseeing on the 21st (Tue) early enough to travel to Barcelona. On the 22nd (Wed), take in nature's colorful creations at Casa de Pilatos, admire the natural beauty at Parque de Maria Luisa, then admire the natural beauty at Royal Alcázar of Seville, and finally don't miss a visit to Plaza de Espana. On the 23rd (Thu), you'll have a packed day of sightseeing: admire the striking features of Torre Giralda, then admire the landmark architecture of Metropol Parasol, then take a stroll through Barrio Santa Cruz, and finally admire the striking features of Seville Cathedral. 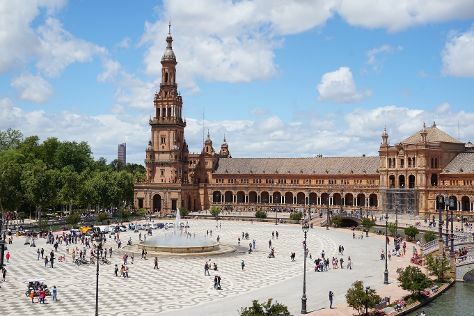 For where to stay, photos, and other tourist information, go to the Seville online sightseeing planner . You can fly from Lisbon to Seville in 4 hours. Alternatively, you can drive; or do a combination of flight and bus. You'll lose 1 hour traveling from Lisbon to Seville due to the time zone difference. Expect a daytime high around 38°C in August, and nighttime lows around 23°C. Finish your sightseeing early on the 23rd (Thu) so you can travel to Barcelona. Kick off your visit on the 24th (Fri): take a stroll through El Barri Gòtic, admire the striking features of Basilica of the Sagrada Familia, then admire the striking features of Recinte Modernista de Sant Pau, and finally appreciate the history behind Casa Batllo. On the 25th (Sat), you'll have a packed day of sightseeing: admire the landmark architecture of Basilica de Santa Maria del Mar, then stroll through Park Guell, then admire all the interesting features of Camp Nou, and finally ponder the design of Magic Fountain (Font Magica). For more things to do, reviews, traveler tips, and tourist information, read Barcelona day trip website . Traveling by flight from Seville to Barcelona takes 3.5 hours. Alternatively, you can take a train; or drive. When traveling from Seville in August, plan for a bit cooler days and about the same nights in Barcelona: temperatures range from 33°C by day to 25°C at night. You'll have a few hours on the 26th (Sun) to wrap things up before traveling home.